Client wants to get key customers to their booth to explain a new product. They also want to be able to get them to answer some survey questions to help them determine some future marketing decisions. Another component is the creation of a social network of their clients where a chat room may be established and where they can continue to communicate to their customers. Lead generation and database building begins with capturing photos of consumers at events. Brands use event marketing to deliver their message directly to consumers. Our event photos bridge the gap between events and measurable online activities. Brand ambassadors capture photos of consumers at events or venues. Consumers receive an individually coded photo access tag with campaign branding. Tags can be passed out on chains or attached to other products such as plush animals, etc. After the event, participants enter code online to retrieve their photo. Participants answer survey questions before viewing their photo. Photos are displayed on a web page with sponsor branding. Participants click through online activities such as viral photo sharing. Follow-up mail can be sent. The site can be used to communicate, even establish a focus group. Customer is able to attract key clients to booth. Surveys are completed for future marketing assessment. There is a continuous exchange of information through established website. NOTE: Presentation will open in a new window and may take a few moments to load. 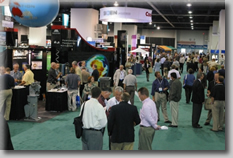 We've got the RIGHT PRODUCTS for your exhibit!